Synagogues are looking for activities that can bring them together, says Nickie Falk, consultant to the Synagogue Leadership Initiative of UJA Federation of Northern New Jersey. Falk – who is coordinating SLI’s One Book, One Community program – said the project came about as an outgrowth of the group’s “synagogue collaboration pods,” targeting areas from programming through purchasing. Congregants and others will read this book as part of a community-wide project. The program, which will kick off on May 9 and last throughout the year, will focus on “My Father’s Paradise” (Algonquin Books) by Ariel Sabar. Falk has been in touch with the author several times. SLI is asking participating congregations – and other communal organizations, such as Ys, Jewish Educational Services, and UJA’s Women’s Philanthropy – to offer a program between September 2011 and March 2012 on any aspect of the book they choose. According to Falk, the federation’s northern New Jersey catchment area includes some 82 congregations. She is hopeful most will choose to participate. 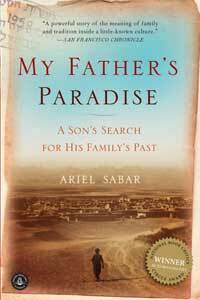 “My Father’s Paradise” tells the story of Sabar’s father, Yona, who emigrated with his family from the Kurdish region of Iraq in the late 1940s, during the waning years of Jewish life in that region. During two conference calls on May 9, one to be held at noon and one at 7:30 p.m., SLI project organizers will discuss possible program ideas as well as additional resources. The federation group will also post its list of suggestions on a special website, Ujannj.org/OneBook. “Ariel has a recipe from his aunt,” said Falk, pointing out that a participating group might choose to focus on that as its activity. In spring 2012, as the project ends, SLI will sponsor an event for the entire community. Both Ariel and Yona Sabar will attend the concluding program. “The book touches on a lot of themes and subjects we can all relate to,” said Falk, noting that Ariel Sabar’s effort to find out more about his own history was to some extent spurred by a desire to pass a meaningful legacy to his own children. For additional information about the project, call Nancy Perlman at (201) 820-3904 or e-mail nancyp@ujannj.org. To join the conference call, dial into (209) 647-1075 and use participant access code 846852#.